Originating in America and used by the Indians, echinacea has remarkable antibiotic, antibacterial and antiviral properties. Thus it stimulates the immune defences. Highly effective before and during (and why not after) the winter to prevent or treat flu, colds, coughs and sore throats. Also used for skin problems and asthma. Ingredients: Echinacea *, Peppermint *, Rose Hip *, Orange Peel *, Thyme *, Sage *. 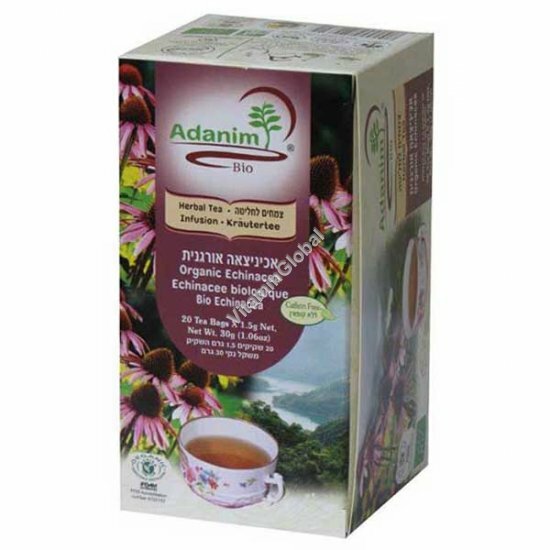 Brewing instructions: Place one tea bag of Valdena organic echinacea tea in a cup and add boiling water. Let steep for 3-5 minutes. Add sweetener if desired.